Holley/MSD is pleased to announce the release of three new products – Sniper Late Model EFI Wet Nitrous Kits, Super Hi-Flo Bottle Valves, and Stainless Hose with black fittings. 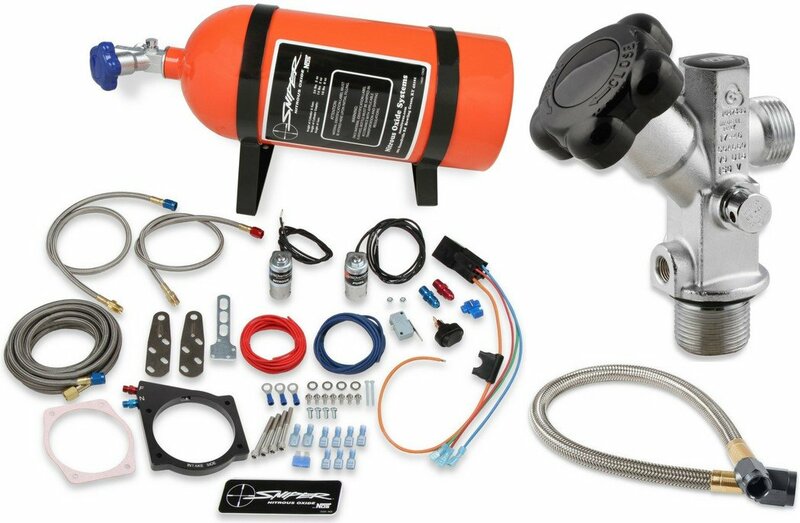 The nitrous kits deliver big power for a budget price, the bottle valves feature new 45-degree handwheels, and the stainless hose comes complete with black fittings. 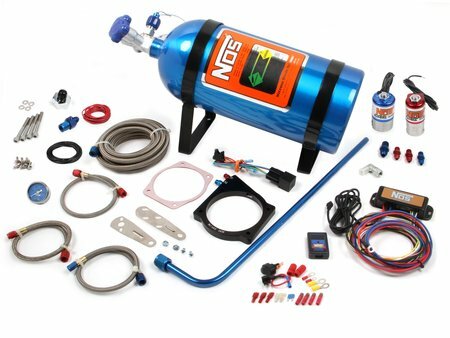 Sniper Wet EFI Nitrous Plate Kits provide all the power nitrous is famous for in a budget-friendly package that supplies up to 175 extra horsepower. They're available for GM LS engines (for both 90mm and 105mm throttle bodies), Ford Coyotes, and Chrysler Hemis. 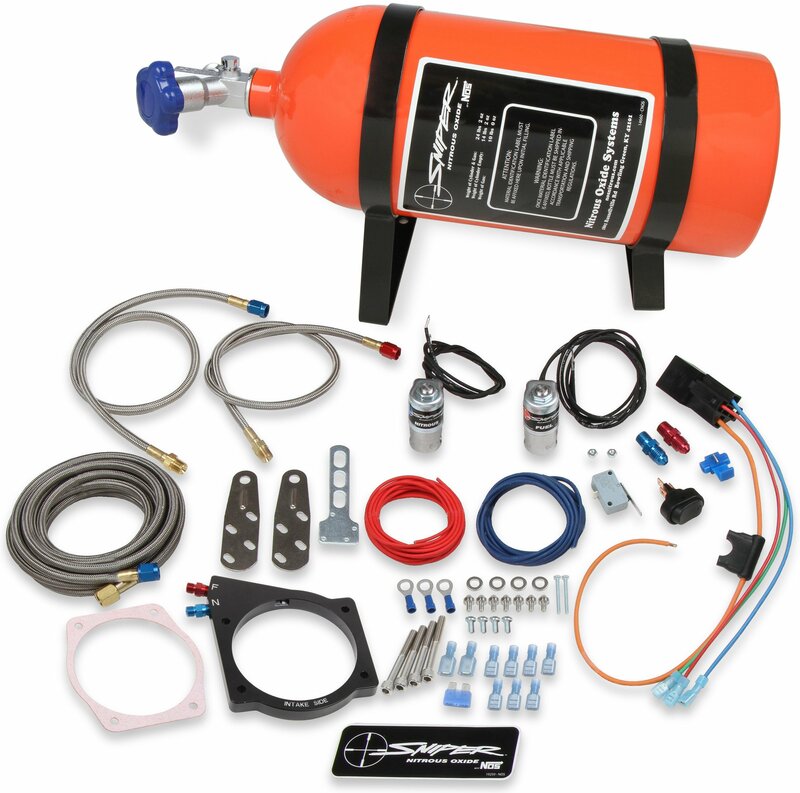 The additional fuel is added though the nitrous system, so no injector upgrade is required, and everything you need is included in the kit: the half-inch billet aluminum plate itself, a 10-pound nitrous bottle and brackets to mount it, braided stainless steel lines, and jetting for an extra 100, 125, and 150 horsepower. The plate fits perfectly between the throttle body and intake manifold, and all the necessary hardware is included for a fast, easy installation. 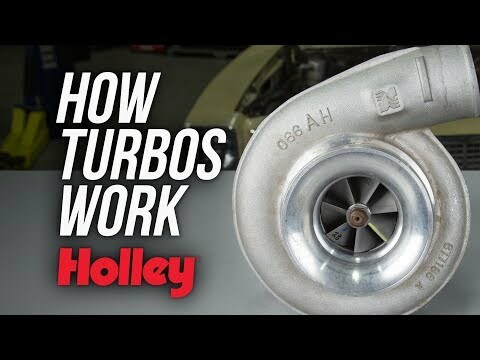 NOS Super Hi-Flo Valves support nitrous systems on engines of 500+ horsepower and have special easy-to-adjust 45-degree handwheels instead of the old-style handwheels that are 90 degrees to the valve. A direct replacement for all NOS bottles 5 pounds and larger, they come with a blue gauge, black gauge, or no gauge and feature 1/8-inch NPT gauge ports, 1/4-inch NPT accessory ports, large outlet ports, CGA #660 outlet threads, O-ring seals, and large internal ports. 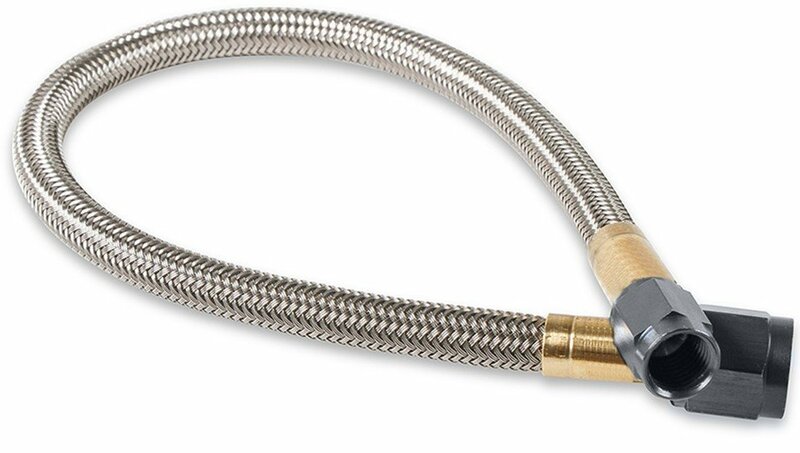 NOS Stainless Steel Braided Hoses are now available with black fittings that complement the other black NOS accessories under your hood. Specially configured for a superior flow-to-strength ratio like all NOS lines, they come pre-installed with -3, -4, and -6 AN fittings in numerous lengths and are PTFE-lined to withstand extreme pressures. They're compatible with both fuel and nitrous, rock-solid from 65 below zero to 450 degrees Fahrenheit, and come fully assembled and ready to install. See detailed product information for GM LS Sniper Wet EFI Nitrous Plate Kits (105mm throttle body). See detailed product information for GM LS Sniper Wet EFI Nitrous Plate Kits (90mm throttle body). See detailed product information for Ford Coyote Sniper Wet EFI Nitrous Plate Kits. See detailed product information for Chrysler Hemi Sniper Wet EFI Nitrous Plate Kits. See detailed product information for Super Hi-Flo Bottle Valves (without gauge). 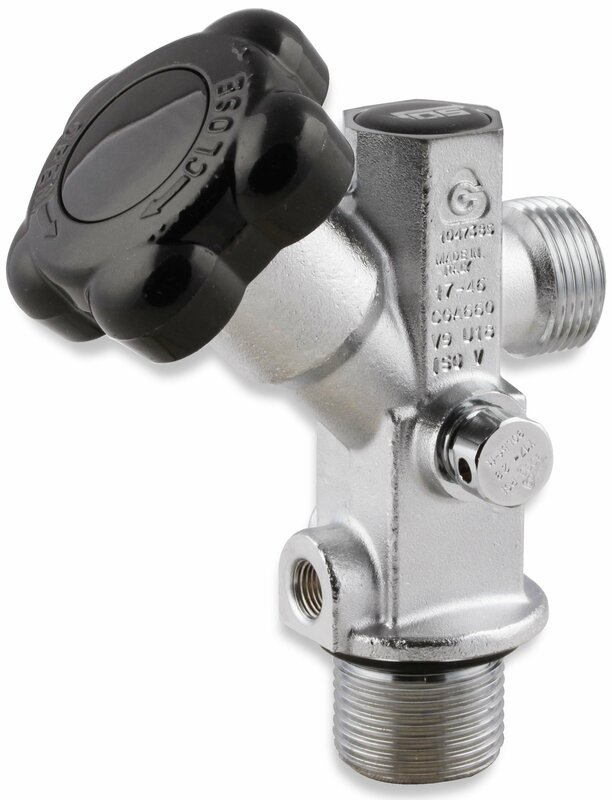 See detailed product information for Super Hi-Flo Bottle Valves (black gauge). See detailed product information for Super Hi-Flo Bottle Valves (blue gauge). See detailed product information for NOS' complete line of hoses and fittings.